The lager revival continues. After the style was commodified over several decades, craft brewers have been taking to the refreshing and crisp category recently. 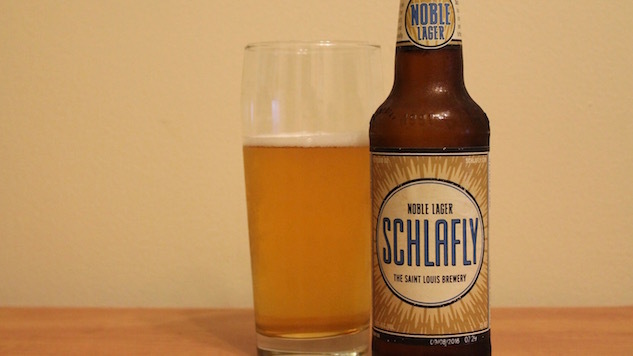 Schlafly’s Noble Lager continues the trend. The beer pours straw yellow with a golden depth and foamy head. On the nose it’s floral and grassy with a sweet malt mixture that’s touched off with just a hint of bitter pine. It smells like it’s going to be a lager that coats the back of the tongue but it doesn’t drink that way, delivering all the sweetness in the front and using the classic and earthy hops to clear off the palate at the back. Noble Lager is bright and refreshing to a “T,” really defined by the crisp finish. The malt sweetness hits the palate only mildly at the front of the profile and the beer grows continually drier through its progression. Ultimately this is one of the drier lagers I’ve had that still fits within the traditional style instead of blasting with a wallop of West Coast hop at the tail. The clean and easy finish makes it a super refreshing beer that will both quench thirst and pair nicely with lighter foods, like a lighter soup or a number of poultry dishes. In many ways, the dry finish combined with the grassy notes gives off that same air that’s in the fields just after harvest but before the ground freezes. I’ve never thought of fall as lager season (rauch/Oktoberfests being an obvious exception), but it makes perfect sense. The crops have been harvested but not yet ploughed under. It’s dry, yellow, and still a little sunny outside: crisp and refreshing before the onset of the more extreme season to come. Loren Green is a Minneapolis writer covering beer, music, and more. Follow him on Twitter at @lorenmgreen.